Ketomac is basically a formulation of, Ketoconazole, which is a used for topical application, as broad spectrum synthetic antifungal agent in a concentration of 2% in a shampoo/cream base. KETOMAC Shampoo/Cream contains Ketoconazole that kills fungi and yeasts by interfering with their cell membranes. It works by preventing the fungi from producing a substance called ergosterol, which is an essential component of fungal cell membranes. The disruption in production of ergosterol disrupts the fungal cell membrane, thereby weakening it. The weakened cell membrane allows the contents of the fungal cell to leak out resulting in its death. The cell membranes of fungi are vital for their survival. They keep unwanted substances from entering the cells and stop the contents of the cells from leaking out. 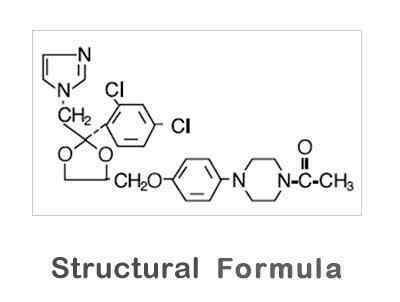 As ketoconazole causes holes to appear in the cell membranes, essential constituents of the fungal cells leak out. This kills the fungi and thereby treats the infection. Ketoconazole works by killing fungi on skin called Malassezia. It is used for the prevention and treatment of dandruff. It treats flaking, scaling, itching, dandruff and also helps to relieve inflammation due to dandruff. Topical ketoconazole is used for treating ringworm, jock itch, athlete’s foot, dandruff, and tinea versicolor. Dandruff is a form of skin eczema called seborrhea. Scalp seborrhea and dandruff do not cause permanent hair loss. Often, scalp seborrhea doesn’t even itch significantly. A number of antifungal treatments have been found to be effective including: ketoconazole, zinc pyrithione and selenium sulphide. 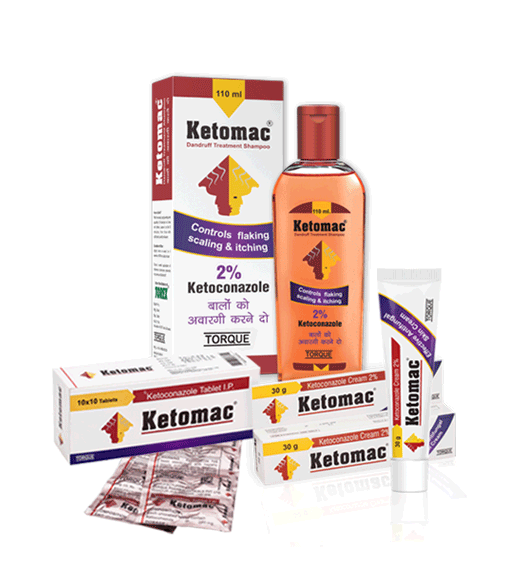 Ketoconazole as a shampoo appears to be the most effective. Tinea (pityriasis) versicolor is a non-contagious infection of the skin caused by Pityrosporum Ovale. This commensal organism is part of the normal skin flora. In susceptible individuals the condition is often recurrent and may give rise to hyperpigmented or hypopigmented patches on the trunk which may extend to the neck, arms and upper thighs. Treatment of the infection may not immediately result in restoration of pigment to the affected sites. Normalization of pigment following successful therapy is variable and may take months, depending on individual skin type and incidental skin exposure. The rate of recurrence of infection is variable. An exaggerated use washing test on the sensitive antecubital skin of 10 subjects twice daily for five consecutive days showed that the irritancy potential of KETOMAC Shampoo 2% was significantly less than that of 2.5% selenium sulfide shampoo. Local burning sensation, itching, or contact dermatitis (due to irritation or allergy) may occur on exposed areas. Oily and dry hair have been reported rarely with the use of Ketoconazole shampoo. In rare instances, mainly in patients with chemically damaged hair or grey hair, a hair discolouration has been observed. Inform your doctor or pharmacist if you are allergic to ketoconazole or to other azole antifungal drugs (such as fluconazole, itraconazole); or if you have any other allergies. This product may contain inactive ingredients, which can cause allergic reactions or other problems. The product should be used with caution in people having liver problems, alcohol use, low testosterone levels, decreased adrenal gland function problems (such as low cortisol levels, Addison’s disease, adrenal insufficiency), little or no stomach acid production (achlorhydria). Ketoconazole is not absorbed into the bloodstream from the skin and is not harmful if used during pregnancy and breast-feeding. Ketoconazole is not detected in plasma after continuous shampooing for long period. Nevertheless, caution should be exercised when KETOMAC Shampoo 2% is administered to a nursing woman. Do not let ketoconazole cream or shampoo get into your eyes or mouth. Incase this happens, wash with plenty of water.